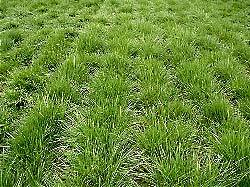 Chewings fescue is an aggressive, bunch-type fine fescue that can overtake other grasses - a bad quality if you want to preserve these but good if you want to crowd out weeds. Because of its high shade tolerance, it is sometimes used to overseed shady lawns, often in mixtures with perennial ryegrass. Chewings fescue is best adapted to cooler areas in the northern United States and Canada, the coastal regions of the Northeast and Pacific Northwest, and elsewhere where summers are cool. It is well adapted to the sandy, acidic, often infertile soils that are found in these regions. Chewings fescue resembles Tall Fescues in growth being more upright than creeping, yet still retaining the fine texture of the fine fescue group. The predominant use of chewings fescue is in the addition to other grass seed mixtures. One of the most popular is the mixture of perennial rye grass and chewings fescue. The adaptations of chewings improves the predominant grasses ability to better perform. Chewings Fescues have long been known for their fine leaf texture and to be among the most shade and drought tolerant of the cool season grasses. Chewings Fescues require less frequent mowing than ryegrass, tall fescue or Kentucky bluegrass, and perform well in low fertility areas such as golf course roughs. As all fescues do, chewings grows well in the shade, is drought resistant, non-aggressive and blends well with almost any grass. Chewings is not as wear tolerant as other grasses of the fescues but can be mown lower and prefers to grow on more sandy soils of low fertility. Chewings fescue germinates in about 14 days. This fescue can be mown low at 1½" making it even more popular if grown alone or in mixtures. Overseeds well into other lawns for better diversity and problems solving. Over the last several years, some new varieties of Chewing Fescue have been developed. These genetically engineered grasses, sometimes called synthetic grasses, have been bred to combine certain characteristics that make them more desirable. One new variety is Windward, (tested as Pick FRC A-93) is an elite new variety of chewings fescue developed at the Pickseed West research facility near Corvallis, OR. Windward was thoroughly tested in the 1999-2002 fine fescue NTEP turf trial with excellent results. Windward Chewing Fescue is a tough, long lived, endophyte enhanced chewings fescue with excellent adaptation to shade, low fertility and acid soils. It is a 4 clone synthetic variety, with the parent plants selected for outstanding adaptation to severe turf usage conditions in the Northeast and Midwestern U.S.
Windward Chewing Fescue has a combination of color, quality, and disease resistance that is superior to nearly all other commercially available varieties of chewings fescue. It is very winter hardy, and is well adapted to low fertility and acid soils, and to shady conditions. It also does well under medium to high levels of fertility. It can be used in a blend with other fine fescues, or mixed with Kentucky bluegrass and perennial ryegrass. It is recommended for use in home lawns, parks, golf course roughs and tees. It does particularly well in lower maintenance situations. Windward Chewings Fescue has been evaluated for nearly all the common cool season turf diseases, with excellent results. It has demonstrated good to excellent resistance to a broad range of diseases including Leaf Spot, Red Thread, Dollar Spot, Summer Patch, Powdery Mildew, Brown Patch and Net Blotch.